The organization paid Ackerman McQueen more than $42M in 2017. According to the suit filed in Virginia Circuit Court, the NRA “requested access to material, readily available records that Ackerman and Mercury are contractually obligated to provide,” but the defendants refused to provide them. The gun group claims it negotiated with AM for access to the records for the better part of a year and its patience has now run out. The NRA claims its contract with AM entitles it upon “reasonable notice” to examine any and all “files, books and records” of both Ackerman and Mercury which pertain to matters covered by the parties’ contract. 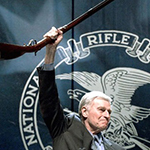 The NRA and AM have worked together for decades and created the high-impact “from my cold, dead hands” messaging of the late actor and five-time NRA president Charlton Heston.